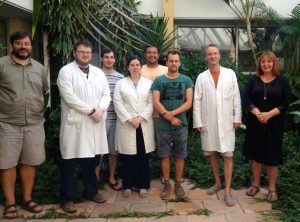 The goal of our group is to elucidate the multiple relations between environment, organisms and their fitness in the lab and in the field, in order to understand and control host-symbiont/parasite interactions. Starting with these biological questions we use state-of-the art molecular, bioinformatics, ecological, epidemiological and evolutionary approaches in an integrative way. We study the influence of the environment on animal evolution and how this interaction has been playing a central role in the diversification and organization of life. Our projects aim to reflect on the impacts that these interactions have on heritable variations of species diversity, biogeography and the impact for human health and welfare. We see inheritance in a broad sense including genetic, epigenetic, cytoplasmic, and holobiont elements. We develop new approaches to control and prevent the spread of neglected tropical diseases (NTD) with particular interest in the different forms of schistosomiasis. NTDs affects more than one billion people, in 149 countries, costing billions of Euros every year for developing economies. Recently, our group described the outbreak of schistosomiasis in southern Europe (Corsica) in 2013. Additionally, we work with laboratories in disease-endemic countries to develop new strategies to control in tropical and subtropical conditions. We elucidate the molecular basis of interactions between host, parasites, symbionts, commensales (the “holobiont”) and the environment by integrative approaches. Complementary strategies are used to explain the mechanisms involved in viability, compatibility and adaptation between different species. A particular focus is put on invertebrate immunology (innate immunity and priming). How to write an AppleScript to connect a Mac to a SMB server. How to prevent (and repair) a Finder crash on an Apple Macintosh (Mac OS 10.4.x). Tools for NGS handling: Eland2Gbrowse. Tools for conversion of output of online repeat analysis tools: Repeat2Tab. qPCR primer design with Primer3Plus. Galaxy installation in production mode. * SCHISTOBEN: (Bourse de Thèse Campus France 2018-2021) Introgressive hybridization between S. haematobium and S. bovis in Southern Benin. * SCHISTOSEN: (BQR 2018) Développement de marqueurs moléculaires et étude de génomique des populations de schistosome hybride au Sénégal. * MISMAtcH: (Contrat ED305 2016-2019) Microbiota Interaction between SchistosoMA and its Host. Caractérisation et rôle du microbiote dans l’interaction hôte/parasite, Biomphalaria glabrata et Schistosoma mansoni, agent responsable de la bilharziose. * RESIVIR: Recherche et caractérisation de virus résidents dans les différents modèles biologiques du laboratoire (Crassostrea gigas, Biomphalaria glabrata, Schistosoma mansoni et Pocillopora damicornis). * MICROBIOMPH: Diversité microbienne et dynamique du microbiote chez le mollusque gastéropode Biomphalaria glabrata. Analyse metabarcoding 16S de la diversité du microbiote intestinal et mucosal et suivi de sa dynamique au cours d’un stress d’infection parasitaire à S. mansoni. * BIOMPHALARIA VIRUS: Identification et caractérisation des virus ARN de Biomphalaria à partir des données de RNAseq. * CUNIPAT: Analyse et conception de modes de gestion intégrés (pâturage, production, santé animale) en systèmes cunicoles AB. Analyse de la résistance aux parasites via l’ingestion de tannins chez le lapin. Analyse métatranscriptomique de la réponse microbienne à la fertilisation. DISCLAIMER – Our group provides this data in good faith, but makes no warranty, express or implied, or assumes any legal liability or responsibility for any purpose that the data is used for. MethDB: the database for DNA methylation and environmental epigenetic effects. PrimerDB: the local oligonucleotide database (access restriction applies). AntibodyDB: the local antibody database (access restriction applies).